From hairy-chested yeti crabs to the deepest known fields, hydrothermal vents have been enjoying a bit of science celebrity in the last few weeks. Beneath the headlines, there has been an eruption of vent-related research published in the scientific literature and some exciting new expeditions just left port. The exhaustive author list on this paper reads like a who’s who in hydrothermal vent biogeography. This is the paper that introduced “the Hoff” crab to the world, but the findings are far more significant. Hydrothermal vent systems are sorted into biogeographic provinces, with different regions supporting different communities. The iconic giant tube worms dominate the eastern Pacific, while the western Pacific (prominently featured in Deep Fried Sea) plays host to fist sized snails, and the Atlantic features shrimp as its dominant species. There are several missing gaps in our understanding of how these qualitatively different communities are connected – the Southern Ocean, the south Atlantic, the Indian Ocean, and the Cayman Trough, among others. Filling in these gaps in our knowledge can help us understand the history and evolution of hydrothermal vent ecosystems. Rogers and his team examined the East Scotia Ridge to explore hydrothermal vent hydrothermal vent communities in the Southern Ocean. They discovered ecosystems dominated by the new species of yeti crab (the aforementioned Hoff Crab), as well as stalked barnacles, limpets, gastropods, anemones, and a predatory sea star. Interestingly, many of the vent species common in other communities were absent here, leading the researchers to conclude the the Southern Ocean may be a new biogeographic province and that dispersal between this and other provinces is extremely limited. While Antarctica present a new frontier for deep-sea biogeography, the Mid-Cayman Spreading Center may help answer a deep mystery. The Pacific and Atlantic biogeographic provinces are dramatically different from each other, with worms and snails dominating the Pacific and shrimp and clams commanding the Atlantic. The Mid-Cayman Trough, home of the deepest known vent fields in the world, fits neatly into the middle of this puzzle. Nestled between the two provinces, this region may have served as a stepping stone between the Atlantic and Pacific before the Isthmus of Panama closed. Remnant populations at these vents may help unlock the history of these two regions. A second major question among vent biologists is how are hydrothermal vents and cold seeps-ecosystems with similar but rarely overlapping species-related. The Mid-Cayman Spreading Center is located near the Gulf of Mexico, a region that host numerous cold seep assemblages. Here, researchers have discovered a new species of alvinocaridid shrimp, similar to thos found on the Mid-Atlantic ridges, which suggests a strong affinity between Atlantic and Cayman Vents. it also suggests that, although there are numerous cold seeps nearby, vent fauna on the Mid-Cayman Spreading Center are still taxonomicaly more similar to the more distant Mid-Atlantic vents. The adventure on the Mid-Cayman Spreading Center is far from over. Just last week, the R/V Atlantis left port with a crew of scientists and the ROV Jason to further explore these vents. You can follow along with their adventure at their expedition blog Oases 2012 where they’ve recently reported that they are On Site and On Target. Verity Nye is tweeting from the deck. You can follow here at @DeepSeaV. The Cayman adventure isn’t the only cruise using online media to bring science to the public. Across the world, a cruise to the Southwest Indian Ridge has recently concluded, and the team has posted numerous beautiful pictures of the endemic fauna found there. These vents, dominated by scaly-footed snails, are yet another piece in the global hydrothermal vent jigsaw puzzle. While the initial findings are exciting, it will take months of lab work before they can properly place the species into a greater biogeographic framework. Big new discoveries are an important piece of the deep-sea puzzle, but equally important are fine scale studies looking at the connectivity of single species within their biogeographic province. In this paper, we investigated the relationship among populations of Ifremeria nautilei from hydrothermal vents across the western Pacific. Ifremeria nautilei is one of two snails that dominate these ecosystems. We found that, thoughout the known range of this species, there are two genetically distinct populations, one in Manus Basin, and one that is spread out between North Fiji and Lau Basin. Surprisingly, there was almost no genetic differentiation between snails from North Fiji and Lau, despite being more than 1000 km apart. This suggests that there is an, as yet unknown, barrier to dispersal between Manus Basin and the rest of the western Pacific. Studies such as this one have implications in deep-sea conservation and can help inform management and mitigation practices in the deep-sea mining industry. Understanding how populations are connected is essential to predicting how an ecosystem will recover after disturbance. Those of you following the broader science blogosphere may be aware of a new bill – the Research Works Act – which forbids federal granting agencies from requiring that results of scientific research be published as Open Access. Open Access means that scientific papers are freely available to all interested parties without fee. Essentially, this new bill would require that American taxpayers have to pay an additional fee for studies that they have already paid for. Read Kevin Zelnio’s summary of the situation at EvoEcoLab. I hope you have enjoyed this post. If any of these news items piqued your interest, and you clicked the link to the original article, you may have noticed that every single paper mentioned here was published Open Access, allowing you, and any interested party, the ability to read the original research and not just my hurried and insubstantial review. Sometimes these are just interesting new discoveries. Sometimes these are crucial pieces of information for stakeholders. Without Open Access, those who need the information most may never be able to see the original sources. Research works, but only when interested parties can access it. Please consider writing your congresspeople to tell them that the Research Works Act stifles scientific discovery, penalizes the taxpayer, and provides little benefit to the scientific community. Diving the deepest hydrothermal vent field in the world - experience it live! 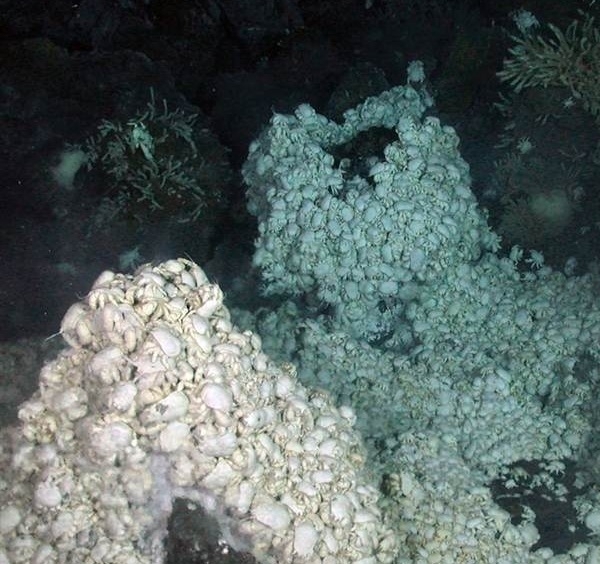 World's deepest hydrothermal vent found! You mentioned the scaly-footed snail several times, and I was thinking, “ok, a little rough skin.” Then I viewed the Southwest Indian Ridge pics… The damn thing is more reptile than gastropod. Love it! Every time I read about vents I think back to the galatic center series by Benford and how it relates to Europa. In the book they drill through a frozen planet and find life in the thermal vents far below. Good stuff. Muccchhhh better pics! I don’t remember seeing the white one in the other article (well, link) but damn they’re cool looking. For some reason, I find myself needing to choose which one’s side I want to be on..
Before reading the article I thought you were talking about Dragon Skin (http://www.youtube.com/watch?v=THQwO7-JMvE) as it relates to the scaly feet. There was actually a huge controversy over the stuff in the Iraq war. Supposedly its lighter, more flexible, cheaper, and most importantly, more effective at stopping bullets. The government not only didn’t buy any, but forebode anyone from wearing it. (to keep up manufacture of IBA’s (the traditional body armor)) The funny thing about this was that the personal guard of diplomats and such were allowed to wear it, provided they bought their own of course. Also, small batch whiskey stills are awesome.